You are probably thinking, what? How could anything involving the end of the world be turned into good? We're talking end of the world for most if not all of humanity but certainly for those under the control of the globalist and the powers that be. Let's picture exactly what we are saying. 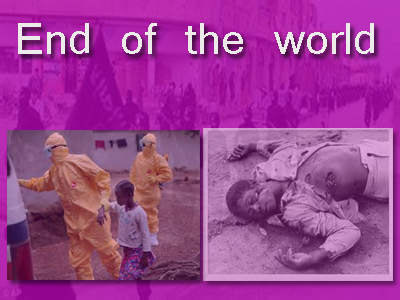 End of the world means mass death throughout the planet. How many people will die has been a guessing game perhaps until now. With Ebola being given the star-level attention from mainstream media, no one should underestimate this or ignore the significance of this. In order to appreciate what I'm saying lets review some basic knowledge about how the globalists think and what their goals are. The current globalist control system all the way up to the highest level has stated it's goals of depopulation and population control. The reason given to the public? To save the planet. Yes there is reason to believe this may be one of the original goals behind the old and dying global warming movement. All of this is wrapped in Agenda 21 which sees depopulation of humans as very "sustainable" and thus a good thing for a healthy planet. The common denominator being this idea that reducing human population reduces carbon footprint. Where else can you confirm these stated goals? Read the Georgia Guidestones which clearly goal to "maintain humanity under 500,000,000 in perpetual balance with nature" So with these factual and clear expressions of their intent, we can now move forward keeping this unhidden fact in mind about the goals of our government. Now let's fast forward to our conversation about Ebola and how it is being given the star treatment by the mouthpiece mainstream media. If you truly care about truth then you probably know by now that the mainstream media is controlled by 6 private corporations who work with a specific agenda. You know that the western corporate media news networks are always on the same page, literally. Whether they are liking you or ignoring you, they act the same. Here in this case, they are all beating the Ebola drums and the ISIS drums so it doesn't take much wild speculation to put it all together. Try to appreciate how everything is going great for the new world order globalists. This is an empire who is sending troops with guns to fight Ebola instead of sending doctors and nurses. This is an empire that is already passing legislation and considering every possible way to explore the Ebola crisis to increase government power and take away individual liberties. We can all see what they are doing. Add to all of this the now out of the bag and publicly known dangers of vaccine. We even have Bill Gates openly admitting that vaccines are designed for depopulation, if they do a "good" job that is. With depopulation of humanity seen and portrayed by the globalist as a good thing, there is no way to logically deny that curing Ebola would be a bad thing to government not a good thing. Government intent and its proof of intent has never been hidden so why then would government suddenly be excited about actually saving lives when saving works against depopulation and Agenda 21? For this reason it is time we make judgments about what is happening to humanity based on what we know not upon what government is willing to admit to the general public through its mainstream media mouthpieces. Humanity is currently now facing many problems, some of these problems are manifesting themselves in broad daylight and being largely ignored. In other words, humanity as a whole has learned to accept too many things that are now sealing its doom. These fully accepted behaviors (like government secrecy, operating a country on private 'I owe you' notes or accepting mainstream media as truth) are now so deeply entrenched into who we are that we are now walking into a scenario where our end and our doom is now becoming easy to see and dictate. Okay, so how can that be a good thing? The great culling is upon us. It is now very reasonable to say that a sizable part of humanity still asleep in the matrix of lies is 100 percent fair game to the globalists. Meaning many people alive will with mathematical certainty fall at the hands of our current government because they've done almost everything to ensure this. They've put all their trust and hope in government. They have complied with the government vaccines that ensure you are one of the people who will help with depopulation. They have succumbed to all the government narratives about "sustainability", ideas about trusting government, the mindset to ignore past crimes of our politicians and support and re-elect them anyway. They have learned to obey when government says come and get your Ebola vaccine. Their bodies have been given over permanently to the evil control system and they are proud (and completely ignorant) of what they have done. Given these circumstances we can now say that if someone imagines their own survival only in the hands and safety of government then realistically they can be counted soon as eliminated from the game. In the end this information war was about knowledge and wisdom. It's about understanding life and how life works at all levels not only at the individual and group level but also at governmental levels. Understanding the new world order agenda is easy its simple and its common sense now that we are approaching a truly end game scenario for humanity. Now more than ever, understanding the new world order is equivalent to wanting to live instead of die. Ultimately, this comfortable and clear understanding of the new world order agenda may be the only thing that truly saves you. As long as you don't truly understand the new world order agenda you will be vulnerable to being fooled, rounded up, easily intimidated, and easily manipulated every single day with new mainstream media stories. Humanity appears to have given birth to a segment of permanent slaves. These people are entirely unreachable as they seem to have sworn their entire existence, safety and mental comfort in the globalist fed paradigms. These are the paradigms of war, hatred, survivalism, corruption, power, control, deceit, greed, depopulation, corporatism, group think, and the worship of government. This now seemingly un-awakenable segment of humanity ensures that the other segment of humanity will experience the challenge of these paradigms. It also guarantees that they themselves will succumb to government however government sees fit. The good part? The awakened segment of humanity will react and respond properly to these extremely fearful scenarios many of which are now solidly in place. A government engineering Ebola outbreak is seconds away, legislation already being put in place for "legally" quarantining humanity. This is a controlling tyrannical government's dream come true. Ebola is to Agenda 21, depopulation, and the police state what ISIS is to continuing illegal justification for global war and expansion of the U.S. empire/new world order. All of this guarantees that government will act and that action will have a ripple effect on all of humanity. People that are awake and aware will finally see the evil face to face and see the agenda in place. As people begin to disappear, more and more they will lose all trust in government and others. They will act in desperation to come closer together and affect change. Acts of desperation done by people with un-waivering belief in humanity go a long way. We've been saying it all along. Things will get much worse before they get better. I now logically and mathematically understand that those who refuse to wake up will perish. This is an elimination you could spell out to them and they will still mock you and ignore you. It's weird how powerful denial can be and because denial is so powerful we will witness the demise of many in real-time. We are already seeing how naive people compromise with government and lie to themselves then accept their poisons and their lies and then they die. These are the people who always "learn the hard way" on everything. Unfortunately this life and death, government control thing is for keeps. So let's keep watching the news as the government rolls along with the ISIS psyop to expand their aggressions around the world while depopulating the world with their toxins in the sky, in the vaccines, in the food we all eat, and throughout the environment. Hopefully we will become better at controlling our destinies and hopefully more people will rise as models of this form of survival. Being truly independent of government requires a healthy mind free of mainstream media lies and the ability to survive (food, water and shelter) without having to be a slave to government. knowledge in this case really is power and very valuable and it will come from observing what we see, in this case, at the expense of those who will fall. So let us plan what we will do as the first few rounds of purging begins. That's right, we must keep up with the way they think so that we can most effectively respond, react and counter these paradigms. In the end, we (those awakened to the grand chess game) will give birth to true resistance. That resistance will be met with violence. Those with courage will survive that (final) round of oppression before we truly turn this around. This is a game of survival we are in. I call it Humanity versus Government but you can call it anything you want. Understanding the greater picture and why all the current events are happening come with wisdom which triggers action. I believe every effort to educate others and every effort at taking action will have a direct impact on the future survival of humanity even if we don't see immediate results. Now go trigger some action, share this message with someone and do what you can given the now sure end-of-the-world scenario many will soon face.